A few interesting waders included a group of 5 Curlew Sandpipers and a Little Stint near the lighthouse and at least 22 Ruffs. A Barred Warbler was in Holland House garden, and 3 Whinchats, a Sedge Warbler, a Whitethroat and 8 Willow Warblers made up the rest of the migrant passerines. Good numbers of Fulmars and Gannets, totalling 357 and 266 respectively, passed by the seawatching hide in 2 hours in the morning, but just 6 Sooty Shearwaters and 1 Storm Petrel were seen during this time. 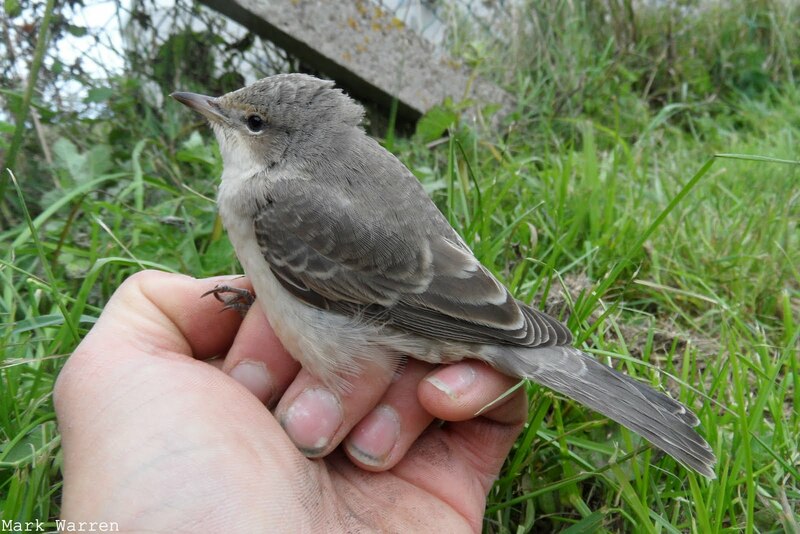 Although at least 7 Barred Warblers have arrived on the island in the last week, today's bird was the first one to be ringed. A count of 53 Sooty Shearwaters passing the seawatching hide was the highest total for this species of the year so far. Other seabirds included 9 Manx Shearwaters, 4 Storm Petrels and 265 Fulmars. A Little Stint was still at the north end of the island and 2 Whinchats and 9 Willow Warblers were dotted around. The other highlight of the day was the first Basking Shark of the year, seen off the north end of the island. Thoroughly foul weather ruined the day's birding prospects to the extent that we resorted to driving around looking for birds from the shelter of the Land Rover. Even then, a Little Stint was the only highlight of the morning's safari. A slight improvement later in the day allowed a quick session of birding on foot, and a Tree Pipit, a Whinchat and a Willow Warbler were seen. Appalling weather, though difficult for birding, is ideal for 'dazzling' - catching waders and other birds at night using a torch and a hand net. Wandering around the beach and Gretchen Loch in driving rain until 4am proved worthwhile with a satisfying haul of birds trapped: 15 Sanderlings, 12 Turnstones, 5 Ringed Plovers, 3 Redshanks, a Dunlin, a Purple Sandpiper and a Ruff were caught and ringed. A much windier day was less eventful, most birds having moved on and nothing new arriving to replace them. The day's highlight came from the seawatching hide, in the form of the first Great Shearwater of the year. The Sparrowhawk and the Swift were still present, and a fairly meagre offering of passerines included a Tree Pipit, a Whinchat and 8 Willow Warblers. A quieter day still had a fair variety of species to keep it interesting, even though numbers of migrants were generally lower. A couple of Common Rosefinches and a new Barred Warbler were the only scarcities, and an unusually early Goldcrest and 2 Yellow Wagtails were new species for the autumn. Other passerines included 5 Tree Pipits, 2 White Wagtails, 1 Common Redstart, 3 Whinchats, 80 Wheatears, 1 Common Whitethroat, 3 Garden Warblers, 26 Willow Warblers and 2 Pied Flycatchers. Waders included 2 Little Stints, a Greenshank, a Green Sandpiper and a Common Sandpiper; raptors were represented by 1 each of Hen Harrier, Sparrowhawk, Kestrel, Merlin and Peregrine; and 2 Storm Petrels and 2 Sooty Shearwaters were the highlights from the seawatching hide. 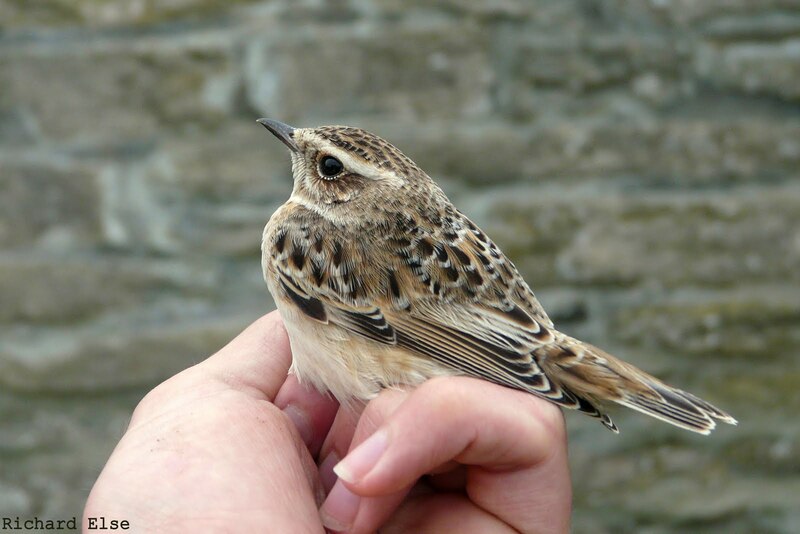 This young Whinchat was caught in the new Heligoland trap outside the observatory. Although numbers of migrants were clearly lower than the previous day, a scattering of birds was present and most appeared to be new arrivals. Only 1 Barred Warbler was seen, but 4 Wrynecks and 2 Common Rosefinches were also recorded. A male Stonechat was perhaps the most unusual sighting, while a variety of other passerines included 2 Tree Pipits, a Common Redstart, 4 Whinchats, a Grasshopper Warbler, 2 Whitethroats, 6 Garden Warblers, 32 Willow Warblers and 2 Pied Flycatchers. The Merlin and the Peregrine were still on the island, and a Swift passed through. A short seawatch produced 2 Sooty Shearwaters and 7 Manx Shearwaters. Wind and unforecast prolonged rain from the east finally brought us the biggest and most diverse passerine arrival of the autumn so far, with just about everything but a rarity. The expected scarce migrants were present in good numbers: the day's totals came to 5 Barred Warblers, 3 Common Rosefinches and at least 8 Wrynecks, 2 of which gave excellent views from the bar-room window. A good list of warblers included 37 Willow Warblers, 1 Wood Warbler, 5 Garden Warblers, 1 Common Whitethroat, 1 Lesser Whitethroat, 1 Blackcap and 1 Reed Warbler; other small migrants included 8 Pied Flycatchers, 1 Common Redstart, 4 Whinchats, a Tree Pipit and 64 Wheatears. 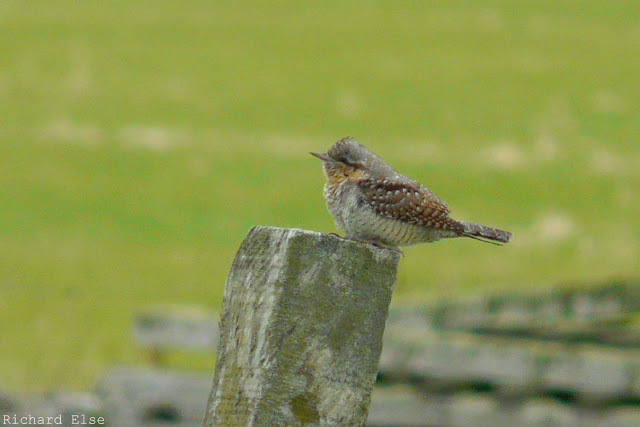 A Cuckoo was the pick of the non-passerines, while a Collared Dove, a Merlin and a Peregrine were also seen. A small arrival of wildfowl brought a couple of Pintails and brought the Wigeon total up to 46. A Lesser Whitethroat was an unexpected migrant at Holland House, where 2 Willow Warblers were also present. There was little else of note besides the usual waders which included 27 Ruffs, over 500 Golden Plovers and numerous small groups of Knots. 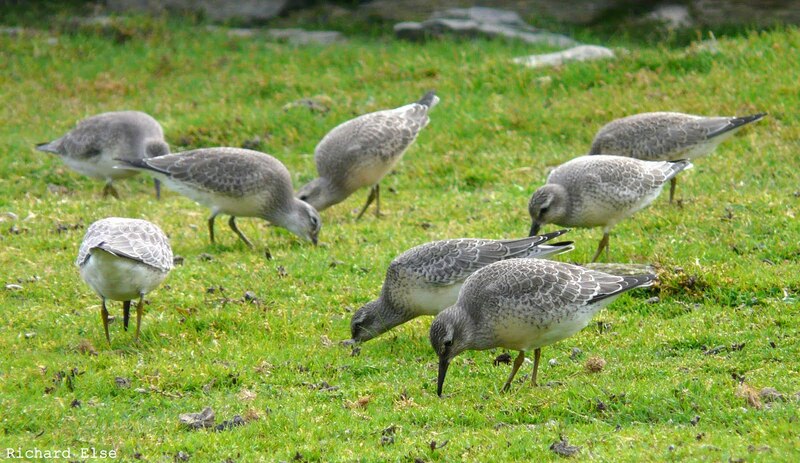 Most of the Knots are confiding juvenile birds that have taken to feeding in the short turf just outside the sheep dyke. The numbers that pass through the island vary considerably from year to year, and counts of over 600 have occurred on a couple of occasions. Staff holidays have meant limited coverage of the island for the last few days, but the week's most notable sightings will be posted soon. 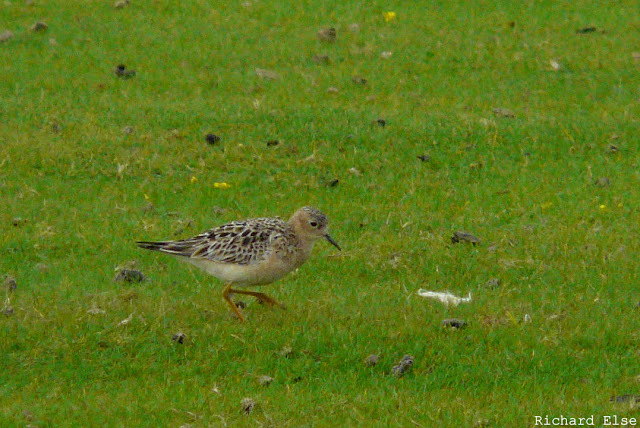 Today's highlight was the reappearance of the Buff-breasted Sandpiper on the golf course. Most other notable sightings and counts were also waders, including 9 Black-tailed Godwits, 47 Bar-tailed Godwits, 204 Ringed Plovers, 133 Knots, 302 Sanderlings, 521 Turnstones, 90 Redshanks, 86 Curlews, 3 Whimbrels and a Greenshank. A Sandwich Tern and 6 Common Terns were in Linklet Bay and a Collared Dove and a Swift were at Holland House. After a gap of several days since the last sighting, the possibility of today's Buff-breasted Sandpiper being a new bird had to be ruled out. Helpfully, good quality photographs show that the pattern of moulted scapulars is the same, indicating that it is indeed the same individual. There was a slight improvement in the variety of migrants on the island, with passerine highlights including an Icterine Warbler, a Black Redstart, a Wood Warbler, 2 Garden Warblers, 3 Willow Warblers and a Tree Pipit. At least 127 Knots were present, 7 Sandwich Terns and 2 Common Terns were around the coast, and a Swift and a Peregrine were seen. 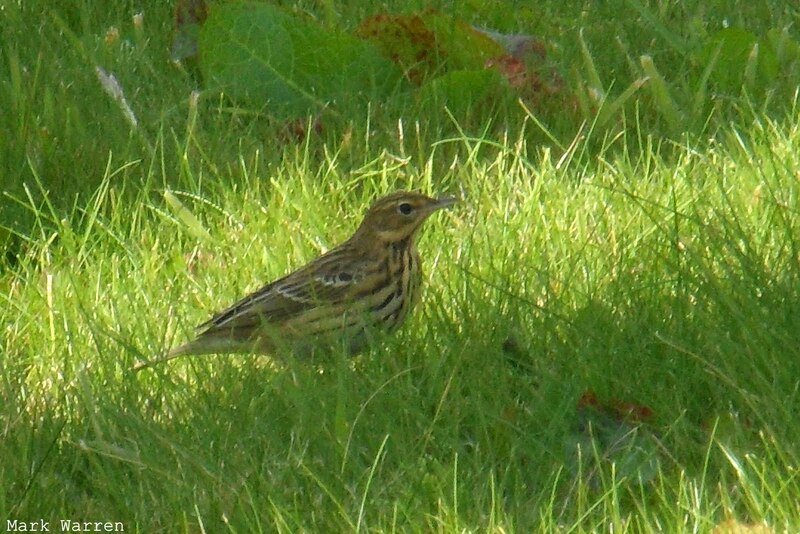 Species making their first appearances of the autumn were the Icterine Warbler, the Wood Warbler, the Black Redstart and this Tree Pipit. South-easterly winds, increasing throughout the day, brought a small number of new birds, but not as much as was hoped for. A Reed Warbler and 3 Willow Warblers were the only new passerines, and a third Collared Dove joined the 2 already present at Holland House. A Couple of Sandwich Terns were in Nouster Bay, while waders included the Buff-breasted Sandpiper, a Black-tailed Godwit, a Greenshank, 29 Ruffs and 43 Knots. 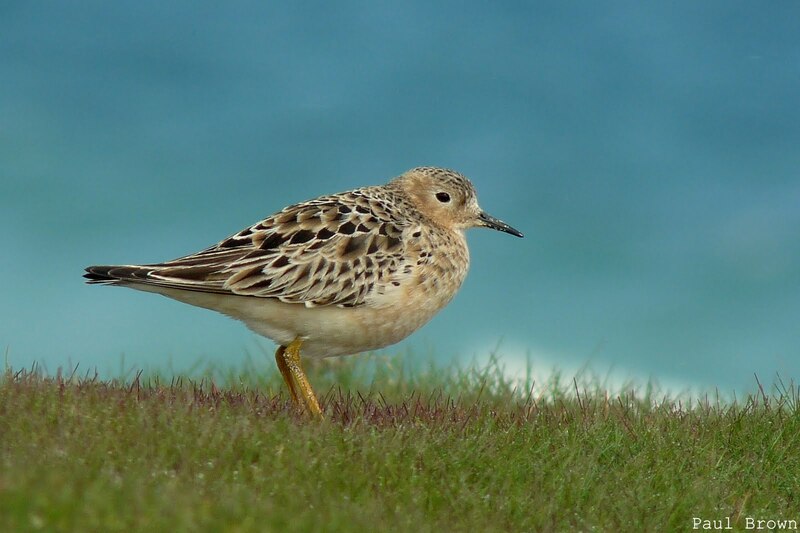 The current influx of Ruffs, the biggest for more than a decade, is still a long way short of the impressive record count of 107 in September 1995. 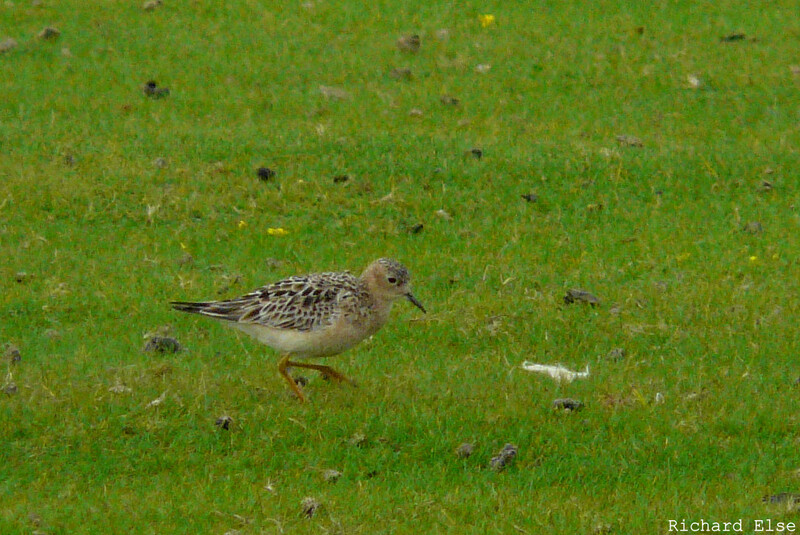 An adult Buff-breasted Sandpiper on the links was easily the bird of the day and the first rarity of the autumn. North Ronaldsay is a very good site for this species: with roughly 20 records since the opening of the observatory, it is a near-annual visitor. That said, this is the first sighting since 2008. Other new birds included 3 Willow Warblers, a Whinchat and a White Wagtail. The Greenshank and 18 Ruffs were still present and 2 Collared Doves were seen. A Peregrine and a Collared Dove were the only new landbirds of a fairly quiet day's birding. Seawatching was mostly very similar to the preceding days, with 49 Storm Petrels, 13 Manx Shearwaters, 7 Sooty Shearwaters and 156 Fulmars passing by, but 836 Kittiwakes was a notable increase. Waders were still present in reasonable variety and number, including 17 Ruffs, a Greenshank and a Whimbrel. 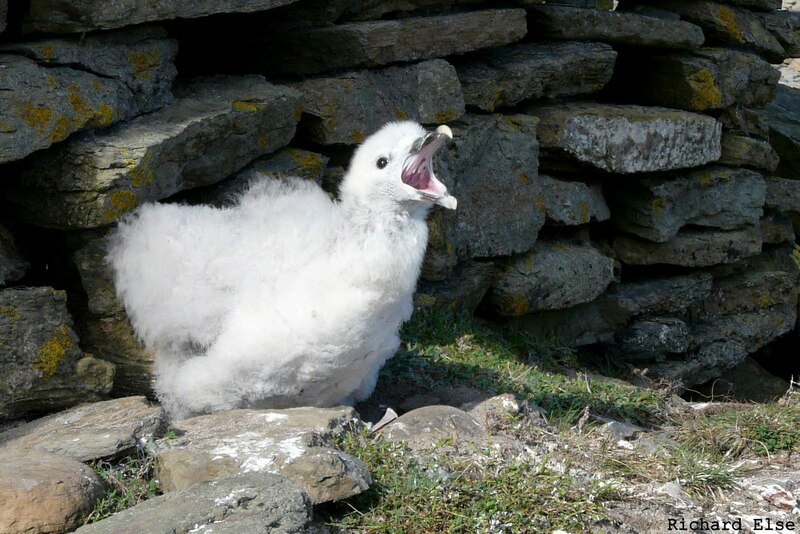 The afternoon's noisome, but always entertaining, task was that of ringing the Fulmar chicks dotted around the island's eastern coast. 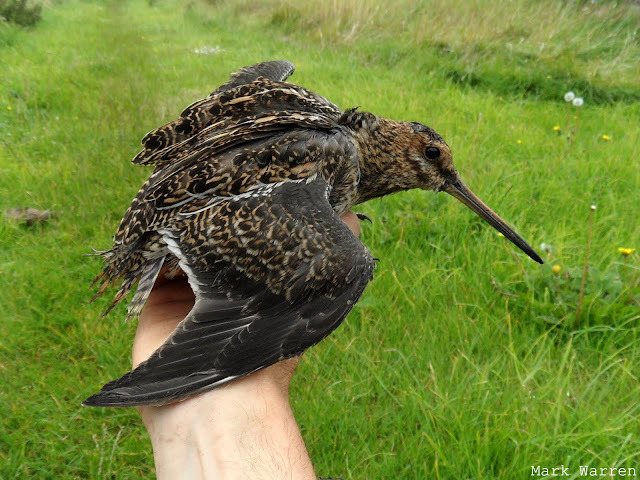 After a poor breeding season, the number of surviving birds was much lower than usual, but we still ringed nearly 80 of the revolting, projectile vomiting creatures. The birds on the west side remain to be visited later in the week. Thrashing the many thistle patches around Lenswick in search of a reported 'pink bird with white wing patches' produced a Whinchat, but nothing resembling the optimistically hoped-for rare Loxia. Seabird passage was much the same as the previous few days, with totals of 25 Sooty Shearwaters, 17 Manx Shearwaters, 28 Storm Petrels and 266 Fulmars past the hide. A Whimbrel and 2 Greenshanks were still present, and the day's Ruff estimate came to 29 birds, although more could easily have been involved. In strong northerly wind and rain, the day's birding prospects were not looking great. The seawatching hide, judged to be the most promising location for finding something interesting, did, however, provide a sheltered viewing point for a reasonable passage of seabirds that included counts of 94 Storm Petrels, 23 Manx Shearwaters, 17 Sooty Shearwaters and 288 Fulmars. Conditions brightened in the afternoon, and checking the usual wader spots revealed a Black-tailed Godwit, 3 Greenshanks and an increase to 19 Ruffs. 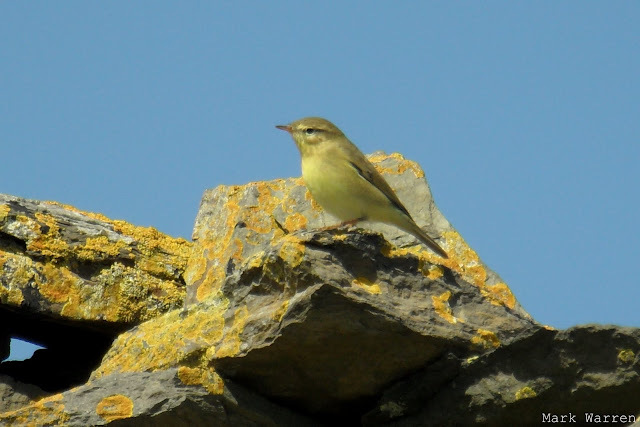 A new Willow Warbler was at Gravity, but there were no other passerine migrants to report. A least 8, quite possibly 10, Ruffs were with the flocks of Golden Plovers; a Greenshank was still on Bewan Loch; and a group of 34 Purple Sandpipers were huddled on the rocks near the foghorn. A handful of new landbirds, the first real indication that the gears of autumn passerine migration were beginning to creak back into motion, were a keenly anticipated and welcome sight. A Grasshopper Warbler was the most unusual, being a scarce species here in most years, but a the first Whinchat and 2 Willow Warblers of the autumn were also nice to see. The best waders were at least 4 Greenshanks and 3 Ruffs; the highlights of a short seawatch were 4 Sooty Shearwaters and 2 Manx Shearwaters; at least 3500 Arctic Terns were still at the north of the island; and the Swift was hunting over the cut fields with the local Swallows. Both Willow Warblers, as expected at this time of year, were brightly coloured juveniles. Once again, landbird migration being barely under way, most birding interest belonged to the marshland wading species that continued to tour the island in search of secluded patches of mud. The fringes of Ancum Loch provided the undisturbed habitat for a couple of Green Sandpipers, a Wood Sandpiper was at Westness, and 3 Common Sandpipers in Linklet Bay completed the sandpiper trinity. There were still plenty of Golden Plovers, Curlews and Oystercatchers in the fields, joined by 3 Greenshanks during a morning spell of fog, and at least 2 Ruffs were seen. The only other sightings of interest were a Kestrel and the long-staying Swift. More fog, lifting for only a few afternoon hours, hindered attempts at migrant census for much of the day. Some more wader movement was evident, though, as 3 Greenshanks and 2 Wood Sandpipers flew south together along the west coast during the short window of visibility. Another Wood Sandpiper and another Greenshank were both present on the island, as was the long-staying Green Sandpiper; and 17 Whimbrels, including a flock of 15, was the highest count of the year so far. There were still 2 Common Terns with 1620 Arctic Terns at the north of the island, and another Swift had joined the lingering bird near the observatory. 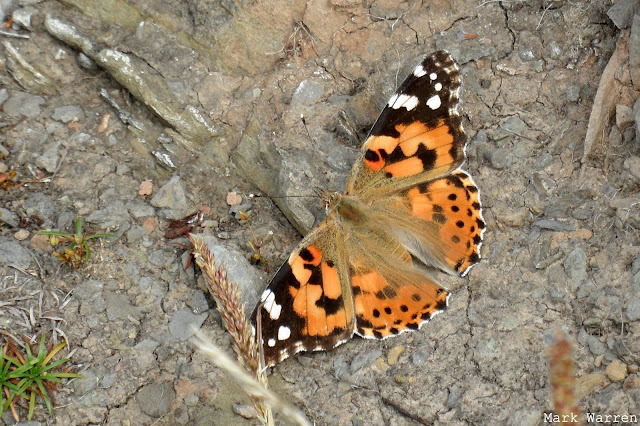 An influx of Painted Ladies was noticeable in the afternoon, with 21 counted around the island. There are currently no resident butterflies on North Ronaldsay, although a colony of Green-veined Whites did once establish itself for a few years, so all records relate to migrants. A small number of Small Tortoiseshells, Red Admirals and Large Whites have also been seen in recent days. While a day of fog played havoc with the island's air travel timetable, it did at least bring a couple of new birds, even if it was at times difficult to see them through the cloud. Most notable was a Brambling near Kirbest - certainly not an expected species at this time of year: a quick scan through the observatory's log files shows that this is actually the first August sighting on record! A Greenshank was the other new arrival, helpfully revealing itself through the mist by its call several times during the day. The Green Sandpiper was still touring its favourite patches of mud in census area B, and the Swift was still near the observatory. 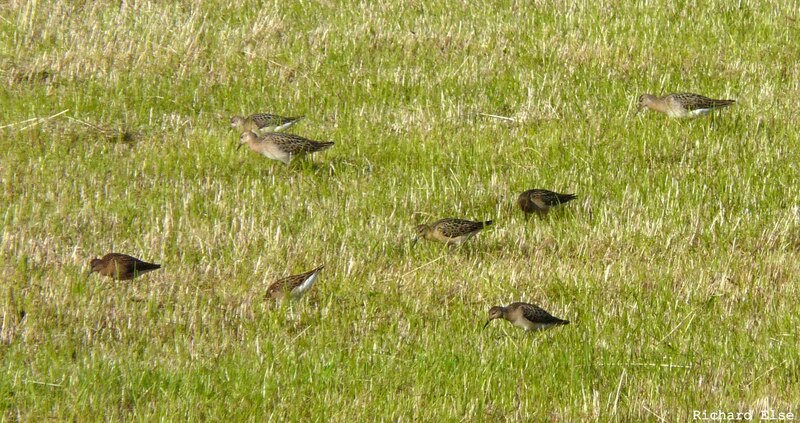 Wader counts included 605 Golden Plovers, 492 Sanderlings and 119 Dunlins. 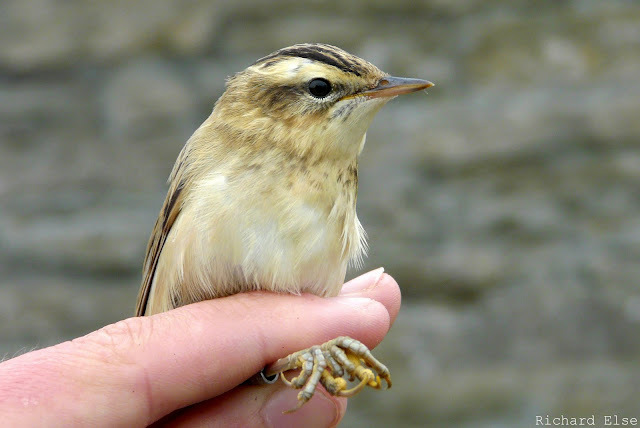 Several pairs of Sedge Warblers nested on the island this year. 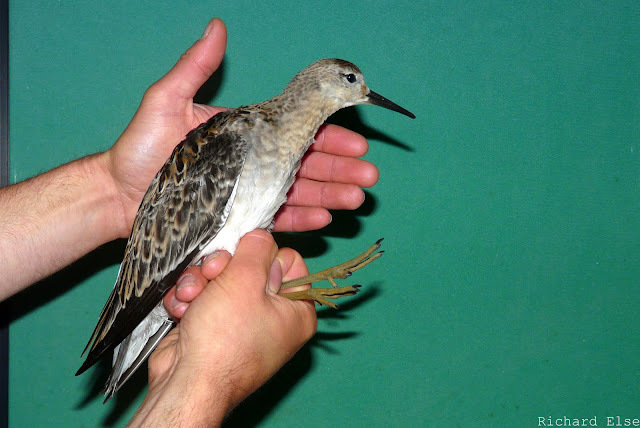 Although returning migrants should be starting to appear around this time, the dispersal of the locally fledged juveniles makes them harder to detect. This young bird, easily identified as such by the clean, contrasting markings, pale creamy ground colour and 'necklace' of speckles across the upper breast, was trapped at the observatory, well away from the breeding sites. A Kestrel was a new migrant in the morning, while the Quail, the Green Sandpiper and the Swift were all recorded again on morning census. Sea passage was almost non-existent, but 4 Sooty Shearwaters were sat on the sea off the north end, 6 Great Northern Divers were in Nouster Bay and a couple of Common Terns were among the Arctic Terns at Bewan. A Quail heard singing from somewhere near Cruesbreck was probably the same bird that was heard there on a couple of occasions in July. The Green Sandpiper was back on its favourite muddy pool at Kirbest, while numbers of other waders included 563 Golden Plovers, 364 Turnstones, 241 Oystercatchers, 39 Dunlins and 37 Knots. A Swift was hunting over Ancum Loch, and the first Garden Warbler - in fact, the first warbler of any kind - of the autumn was the highlight of an evening mist-netting session. A further increase in the number of Arctic Terns took the total present at the north end of the island to over 4000, many of them roosting just offshore on Seal Skerry. A third consecutive night of petrel-catching sleep-deprivation was less hectic than the previous night's session, with 17 Storm Petrels, including another Norwegian-ringed bird, trapped in the nets. A quiet day's birding had little besides a Common Sandpiper, 9 Whimbrels, 42 Dunlins and 7 Purple Sandpipers. A flock of Arctic Terns, comprising 770 or so birds, was back at Bewan, and a Swift was seen. Some attractive wader habitat is developing nicely at Kirbest. An attempt to catch one of the Green Sandpipers that have been feeding in the area has been unsuccessful so far, but one of at least 10 Snipe using the muddy pools was trapped and ringed. A busy night of mist-netting produced 73 Storm Petrels and another Leach's Petrel. A Green Sandpiper was still present at Kirbest during the day, 163 Sanderlings were on the beaches and a Sand Martin and 2 House Martins were seen.